This cucumber is long, cylindrical, straight, firm and smooth, with excellent uniformity. 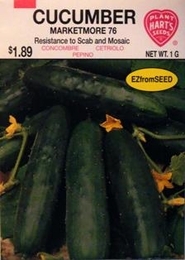 Resistant to Cucumber Mosaic virus, Powdery and Downey Mildew and Cucumber Scab, makes this variety a reliable performer. Highly recommended for crop harvest in early fall. For best results, or where space is limited, use a trellis or stakes. For best flavor, pick fruits when 6-8 inches long. Do not permit fruits to grow too large as Cucumbers are picked as immature fruits. Control insects with vegetable dust.